Raised in Oakland, California, Hannah Gordon grew up a fan of the Raiders. She even worked for the team as a law clerk in 2006. To this day, however, Gordon considers herself a fan of the San Francisco 49ers—as she should. After all, she’s the organization’s general counsel. 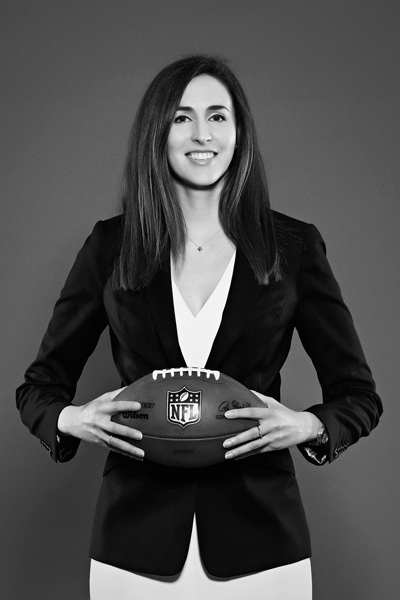 In her role, Gordon oversees the team’s and the stadium management company’s legal, risk management, and external affairs functions, as well as the team’s museum, youth football, STEAM education, and community relations departments. This idea of a level playing field applies to all aspects of the San Francisco 49ers as both a team and an organization. That’s why, since joining the 49ers, Gordon has played a significant role in ensuring women and people of color receive more opportunities in the world of professional sports. During her discussion with Modern Counsel, she went into detail about several of the team’s diversity and inclusion (D&I) initiatives, and where she sees it all going from here. What are your highest priorities when it comes to D&I as it relates to your role within the 49ers? It’s not any formal part of my role within the 49ers. It evolved naturally. My goal is for us to win Super Bowl championships. To succeed, you need to have a diverse group of people. If you don’t have different perspectives, then you don’t have intellectual diversity. Without that, you can’t build the best team. One of the more notable D&I initiatives is the diverse slate interviewing policy, which ensures that women and people of color are considered for every full-time business operations position. What has the response been in its first year? We feel really good about it. Everyone here has embraced it wholeheartedly, which is important. However, a year in is too early to be looking at outcome, especially in a small company like this. We focus more on process than outcome at this stage. I’m curious to see where we are in about another four years. I think five years is probably the right mark for sufficient data. The 49ers are also the first—and so far only—NFL team to take the equal pay pledge. What was the conversation like leading up to that? Our manager of corporate communications, Emily Lucas, actually found that opportunity for us. I love that we’re in an organization where people bring forward ideas like that and where young women like Emily feel comfortable saying, “Hey, this something cool that we could participate in.” Everybody was on board immediately. Do you think other teams will follow the same example the 49ers have set for the pledge in the near future? That was something that was a focus of the Obama administration, and as far as I know, the pledge is no longer on the White House web page. So I have no way of knowing who else has committed. To me, it is not about opportunities for women alone. The real question is: Is there a fellow human being who does not have a voice, and what is my responsibility to use my voice for them? Another one of the 49ers’ D&I initiatives is the Denise DeBartolo York Fellowship, which you recently played a role in broadening. How did that come about? We decided to make it a rotational program. The fellow last year rotated for two months among six different departments, where women have historically been underrepresented in sports. The hope there was that you bring in somebody and you expose them to these areas they might not have otherwise been exposed to in hopes that they can become a full-time employee at some point. You’re building a pipeline of talent in the areas where you don’t typically see a lot of women. What’s a typical day like for a Denise DeBartolo fellow? Does their routine stay fairly similar throughout that period, even as they’re moving throughout different departments? For our current fellow, once a week, she meets with Harpreet Basran in human resources, who is the liaison for this program. Once a month, I meet with her for an executive mentoring lunch. Then, it all depends on what department she’s currently in. When she was in premium sales, she was out there cold-calling people and selling suites and seat licenses. I will never forget the smile on her face when she told mer about her first sale, then the way she was grinning ear to ear almost a year later when she was hired full-time as an associate producer in 49ers Studios. Was creating these kinds of opportunities for women a part of your work before you came to the 49ers, or has it increased over time? It increased because I have the power to do something about it now. To me, it is not about opportunities for women alone. The real question is: Is there a fellow human being who does not have a voice, and what is my responsibility to use my voice for them? It may be something small like I have been hounding the league office for a year on stadium locker rooms for female staff on away games and female on-field apparel. The people who are affected would never complain. They are working on it. We all have something that we can do locally to help others, but we have to keep the perspective global. Equity is not an issue in one industry; it is an issue in the fabric of our culture and in our country and our world.